I’m delighted to announce that I am pregnant with our second child. 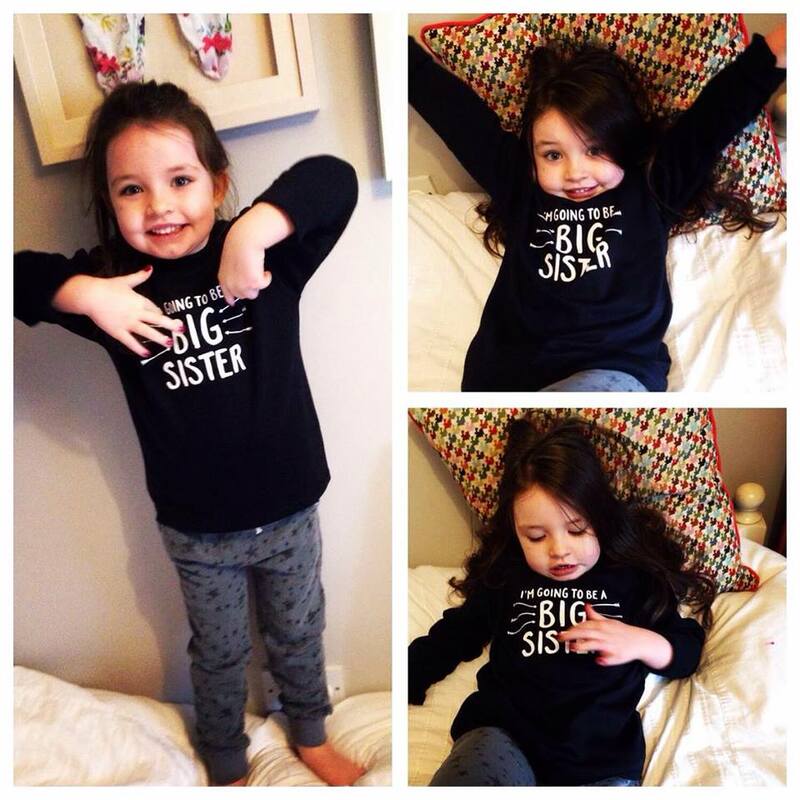 Olivia is thrilled to be becoming a Big Sister as you can see by the photo. But to be honest up until now, there hadn’t been much excitement as I’ve been suffering with the devil of all morning sickness – Hyperemesis Gravidarum. Surprisingly enough, not everyone has heard of HG. I had though, because my sister suffered with it too, eleven years ago. Hyperemesis is a severe form of morning sickness. I had morning sickness on my first pregnancy, well all day sickness I called it. It was pretty bad at the time too, but HG is a hundred times worse. First time around I was sick but I was still able to work, this time it’s very different. In the beginning, the nausea and sickness was so severe I was bed ridden for a few weeks and unable to work. In those weeks I ended up in hospital with an IV fluid line in my arm because I was dehydrated. My appetite was non existent, I could barely drink without being sick, I couldn’t even stand up straight because I was in pain. It really was a horrible, horrible time. While in hospital, I was given an anti-sickness injection to ease the vomiting and nausea (more about that later) I can’t tell you how much better I felt after that injection. Not another day was I physically able to go on. I was feeling extremely down too, I looked dreadful and my body ached from the vomiting. I felt Olivia suffered also because I was so ill that I couldn’t be a proper mother to her. Thankfully my family helped out looking after her while I was in bed and my husband was at work. I’ve heard of women who suffered for far longer than a few weeks which I find incomprehensible. Maybe in a way I was lucky to have become dehydrated so quickly as I was admitted to hospital and treated. I’m not out of the woods yet though, I’m still sick every morning and I suffer with nausea until early afternoon, which is still tough but nothing compared to how I felt a month ago. Isn’t pregnancy hard enough without having to suffer like this? Like come on Mother Nature, give us a break! I’ve decided to share a photo of myself while in hospital with HG. This was how I looked and felt for weeks, it changed me physically and mentally so I’m just putting it out there. Be nice please! Once ketones were identified in my urine and doctors realised I was vomiting up to eight times a day, I was admitted to hospital to have an intravenous drip inserted into my arm. Within half an hour I felt a sense of relief in my body. 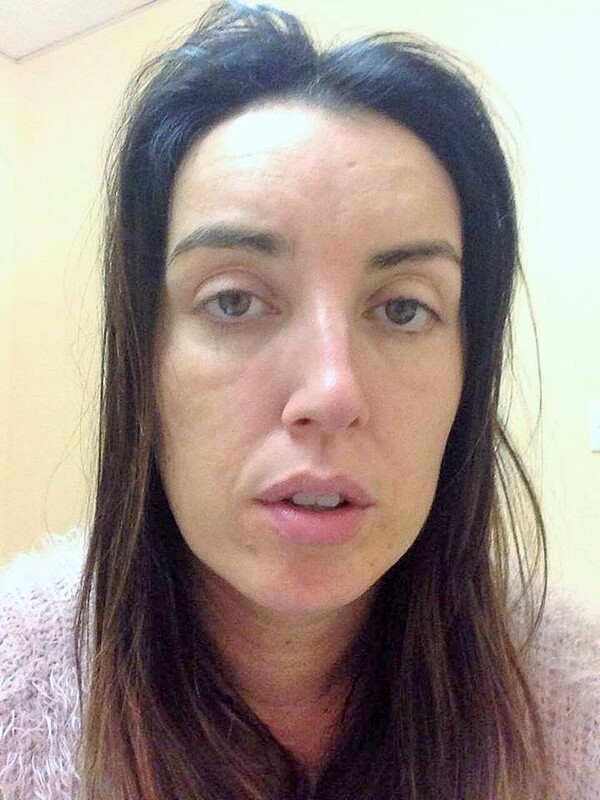 The anti-sickness injection wa s also given to me, but before it was, I was a little concerned as I had always thought that when you’re pregnant, no medicine was safe to take other than paracetamol! But that isn’t the case – In extreme cases there is safe anti sickness meds that you can take. I was never so relieved in all my life to hear those words. I would’ve given myself the jab if I had to! Over the past month or so I’ve had three scans in the early pregnancy unit to monitor my growing foetus. It’s protocol to rule out any other reason why I may be sick, but all is well and it’s growing exactly as it should be. It was a huge relief to say the least. I shed a tear, while also saying to myself “now can I please not be sick anymore!! !” I was prescribed Stemetil tablets to take twice a day. Those tabs have been my lifeline. I’m back at work now, it’s not easy but when you’ve gotta work, you’ve gotta work! I find dry foods help with my nausea, like crackers and digestive biscuits and on the other hand I like mixed fruit and custard too. They’re easy on the tummy whilst having some flavour too. Whilst experiencing HG I have thought about other women who may be in the same boat as me. But unfortunately we’re not actually in the same boat per se, we’re at home or in hospital going through it all ALONE. Yes, our husbands, boyfriends, girlfriends, sisters, mothers are with us sometimes but no one really knows how you feel unless you’ve experienced it first hand. Depression is a strong word to use but I honestly felt depressed. I’m a positive person in every way but this really brought me down and I couldn’t see the light at the end of it all, until now that is. Now I feel it’s easing as every day passes – Every time I’m sick, I say to myself, “another one down, another day closer to the end”. The positivity is slowly creeping back into my mindset and I’m grateful for that. All the negativity shrouded the very reason why I was feeling so ill – The tiny human growing inside me. I couldn’t see it as a baby at the beginning because I was so ill and I’m not one to exaggerate but I literally thought I was dying. Now I’m imagining the future with our new baby and our beautiful Olivia who turned four yesterday and it’s very exciting indeed, just how a pregnancy should be. If anyone is reading this and is suffering in the same way, feel free to message me because you’re not alone. I sympathize completely with you. Other women that are known to have suffered with it in the past are most famously, the Duchess of Cambridge aka Kate Middleton, Frankie Bridge (The Saturday’s) and Charlotte Bronte. Not so famous – My sister Lorraine 🙂 who was a heroine throughout her pregnancy! So sorry for my late response! It sounds like you did have HG though but in a “milder” form. Although it was far from a mild feeling I’m sure! I still feel miserable but have put on weight this month as I’m eating better. Work is a complete headache, I struggle everyday. I’m weighing up my options at the moment to be honest. Congrats on your new baby, I just love her name! Congratulations on your news, but So sorry you’re going through HG! It’s totally awful! Are you in contact with anyone at the charity Pregnancy Sickness Support? They offer support and advice to women suffering with hyperemesis and there’s a forum sufferers can access to chat to others going through the same thing. I’m a volunteer for them, we would love to share your blog post with our followers and supporters, if that would be ok? I hadn’t heard of PSS before. I just had a quick scroll through it now. I’m saddened to think women terminate their pregnancies due to the severity of their suffering. It just shows how horrible HG actually is. I’m struggling daily and I have to keep reminding myself it’s worth it. Hi sorry only replying to your comments now! Yes you can share my blog post. Just send me on the link when you do? Yes that’s fine 😊 my Instagram is olivias_mother_blog and I have a Facebook page too by the same name. First off, congrats on the pregnancy! That is so exciting for you and your family. I dealt with HG with my pregnancy last year(funny enough, my daughter’s name is Olivia too!). I completely relate with what you are saying about the depression and it really takes a toll on you mentally. There is a wonderful group on facebook that I am in that supports women during HG pregnancies and I’d be happy to give you more info if you are interested. Those women made such a difference in my pregnancy and helped me stay sane knowing I wasn’t the only one dealing with it. I’m here if you want to chat or vent or anything. Hi thanks for getting in touch. I would love to know the name of the group on fb. Is it Irish or the U.K.? It’s so good to hear about other women out there. Support is vital.